Missed the beginning? Start here. The Ha’Ivri Masthead, August 1897. Courtesy of Yeshiva University, Mendel Gottesman Library. 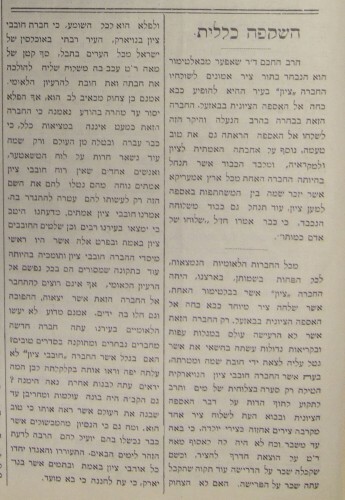 In August 1897, Katriel Hirsch Sarasohn, the publisher of the Hebrew-language newspaper Ha-Ivri in New York City, used his lead article to attack the New York Hoveve Zion [Lovers of Zion] Society for failing to send a delegate to the first Zionist Congress, soon to convene in Basel, Switzerland. Sarasohn contrasted the commitment of the Baltimore Zion Association with the ineffectiveness of its New York counterpart and employed the embarkation of Rabbi Schepsel Schaffer as a club with which to beat New York’s Zionist leaders. Sarasohn was a highly critical and contentious publisher. In 1892 he had printed an attack on Shavei Zion by S. W. Natelson, denouncing the leaders of New York’s Shavei Zion and Hoveve Zion organizations in such inflammatory terms that Adam Rosenberg, an officer of Shavei Zion, felt compelled to sue for libel. Rosenberg accused Sarasohn of “publishing the most scandalous libels against the officers of Hoveve Zion charging them with swindling, humbugging the poor and embessling the Society’s funds.” The case achieved sufficient notoriety to be reported in the New York Times, and Sarasohn appears to have been compelled to cease his attacks on Rosenberg. This document is notable not only for what it can tell us about the state of Zionist organization in New York and Baltimore on the eve of the Congress, but also for what it says about the role of personality and politics in the Zionist movement. Soon after the first Zionist Congress adjourned a new Federation of American Zionists was organized, giving the Zionist movement in America greater coherence nad strength. But debate, dissent, and conflict persisted nonetheless. 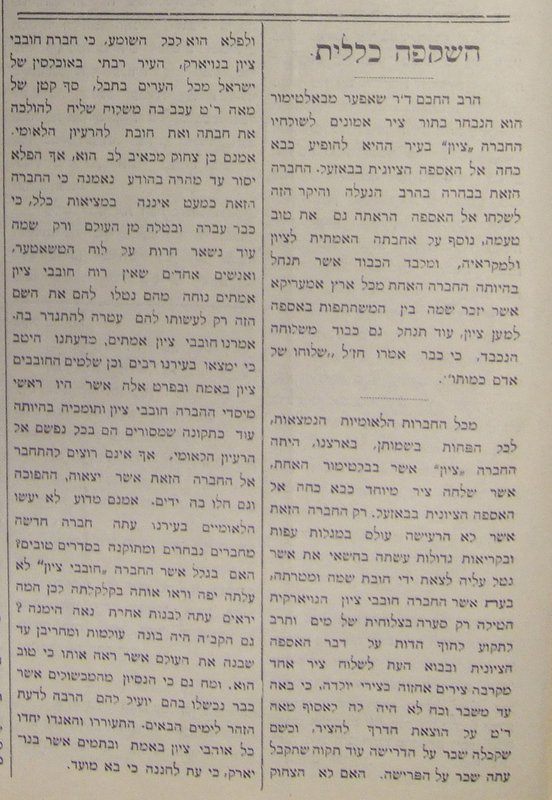 The article, Ha’Ivri, August 1897. Courtesy of Yeshiva University, Mendel Gottesman Library. Of all the nationalist [i.e. Zionist] organizations in our country – at least in name – only the Baltimore Zion Association has sent a special delegate as its representative to the Zionist Congress in Basel. Instead of bombarding the world with loud proclamations and fliers, only this group quietly discharged its responsibility and duty, while New York’s Hovevei Zion created a tempest in a teapot and blew its horn about the Zionist Congress, but, when the time came to send even one delegate, they were overwhelmed with the pangs of childbirth like those of a woman in labor who wasn’t strong enough to give birth, unable to collect $100 to send the delegate on his way and acting as if they hoped to be rewarded for talking and not doing. Isn’t it a laugh and an amazement to all who hear it, that the Hovevei Zion in New York – the city with the largest Jewish population in the world – let such a small amount as $100 prevent their sending a representative to show their love and commitment to the national goal. Indeed, it is a heartbreaking joke, but the surprise quickly dissipates with the realization that in reality this organization barely exists. The truth is that it is almost extinct, fading from the world with only its name still inscribed on its charter, while a few individuals who lack the spirit of the real Hovevei Zion have appropriated its name to crown and adorn themselves. We say “genuine Hovevei Zion” because it is our strong belief there are many true lovers of Zion in our city, particularly those who founded this organization, those who supported it when it was doing well, and those who were devoted with all their being to the national goal: however, they don’t want to be affiliated with this current organization, which they left and which has turned away from its purpose. Why don’t the nationalists [Zionists] in New York City create a new society of select members that is managed in better order? Is it because Hovevei Zion did not turn out well and they saw its disintegration, making them fearful about launching a new society that is true to the cause? Even G-d created and destroyed many worlds until he built this world, which He saw was good. Experience from past failures will show them how to be more cautious in the future. Arise and unite all you in New York who are true and honest lovers of Zion, because the time of redemption is now! Klausner, “Adam Rosenberg,” 25 lff. Sarasohn also carried on a lengthy feud with Wolf Schur, the publisher and editor of Ha-Pisgah. See Kabakoff, “The Role of Wolf Schur,” 431.